Some may find it ironic that after a lengthy hiatus, Jon Stewart returned to host “The Daily Show” just days before the Sept. 9 re-launch of CNN’s “Crossfire.” During a memorable October 2004 appearance on “Crossfire,” Stewart said the show’s liberal-vs.-conservative argument format was “hurting America” and accused the hosts of failing to live up to their “responsibility to the public discourse.” Two months later, CNN president Jonathan Klein cancelled the 23-year-old show, saying he agreed “wholeheartedly” with Stewart’s assessment. Now, under new CNN Worldwide president Jeff Zucker, “Crossfire” is back at 6:30 p.m., injecting more opinion-driven programming into an evening cable news landscape that, according to a Pew Research Center analysis, is already chock full of ideology and commentary. The ideological combatants on the new “Crossfire” include a conservative team of former House Speaker and presidential candidate Newt Gingrich and columnist and commentator S.E. Cupp. Their liberal opponents are Stephanie Cutter, a former deputy campaign manager for President Obama, and Van Jones, the former special advisor for green jobs in the Obama White House. All of them have made numerous appearances as cable pundits. The snapshot analysis of more than 100 hours of programming in late 2012 found that liberal-dominated MSNBC led the way in evening commentary (86% of its airtime) compared with only 14% devoted to reporting. The Fox News Channel, with its conservative lineup, had the highest proportion of reporting (44%) although there was still more opinion (56%) on its evening programming. In contrast with its two main rivals, CNN has traditionally branded itself around coverage of breaking news events and a more balanced menu of political commentary. And over the course of the entire day, the Pew Research study showed, it was the only one of the three cable channels to offer more reporting (54%) than opinion (46%). But in the evening, CNN leaned more heavily on opinion—66% as opposed to 34% reporting—than Fox News. The resurrection of Crossfire, which will replace a half-hour of Wolf Blitzer’s “Situation Room,” will likely increase the commentary quotient. CNN’s ratings and programming problems, particularly in the evening, have long been noted by media analysts and reporters, and some have attributed them, in part, to CNN’s failure to follow the Fox and MSNBC model of personality-driven, highly partisan programming in the evening. In that context, the return of Crossfire could be a signal that CNN executives agree with that critique. The viewership statistics—in the era between Crossfires—do tell a story. 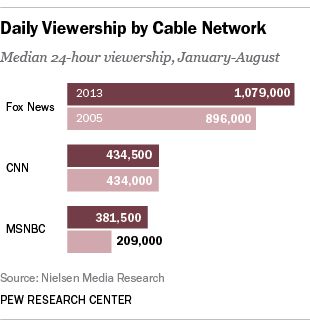 When you compare January-August 2005 to January-August 2013 audiences, median viewership across the entire day for the Fox News Channel grew from 896,000 to nearly 1,080,000. The MSNBC viewership increased from 209,000 to almost 382,000. At CNN, viewership was flat, barely inching up from 434,000 to nearly 435,000 in that eight year period.